Sign up to receive PrayerPoints here! I have been flirting with The Law a bit lately. It always happens on our trips, especially a really long one. I am tired of being in the car and I am ready to get where I am going and, once in a while, I tend to be a little heavy-footed and my speed creeps up. Are there areas in your life that have you flirting with disaster? Knowing the law is certainly one thing. Striving to obey it is another. I knew the law and willfully disobeyed it. This is definitely one area in my life where I try to see how far I can get away with breaking the law. I push my “luck” on the open road. Even though I haven’t been ticketed for speeding in a really long time I know I would completely deserve whatever comes my way. There is a boundary line and if I knowingly cross it and I am mature enough to accept the consequences. That ticket would mean a fine and maybe points on my license. I am sure I would be sorry I was “caught” but that is definitely not the same as being sorry for my sin. And there is a difference. When my heart is contrite, I experience guilt, regret, remorse, rue, and/or shame. It isn’t about being caught, it is about the sin in my life. Coming to the knowledge of my sin is overwhelming. But knowing my Savior delivers me from my sin and cleanses me from all unrighteousness is also overwhelming. and cleanse me from my sin. and my sin is always before me. and justified when you judge. sinful from the time my mother conceived me. you taught me wisdom in that secret place. wash me, and I will be whiter than snow. let the bones you have crushed rejoice. and blot out all my iniquity. or take your Holy Spirit from me. and grant me a willing spirit, to sustain me. so that sinners will turn back to you. and my tongue will sing of your righteousness. and my mouth will declare your praise. to build up the walls of Jerusalem. May God’s law work on our hearts and root out the sin that wants to rest there! Speed Limit 5, Speed Limit 45, Speed Limit 70, Speed Limit 80, School Zone, Construction Zone….most speed limits are posted in an effort to protect those who are living or active in a particular area. We have a new driver in our home and so we have been paying pretty close attention to speed limits. Sometimes I overlook them, resent them, miss them. In general, I try to follow them but it is hard when you feel like you are the only one! Have you noticed there are times when life moves so slowly? Maybe you are waiting for a report from the doctor or your are in a time of life when you are out of your element, bumbling along. Other times life moves rather quickly and you find you are traveling almost at the speed of light! Different parts of life seem to happen at different speeds. If you have grown children, maybe it feels like the kids grew up so fast or maybe it felt like forever to you. There are times I have found myself trying to ‘speed’ through some experiences that I would really rather not be in the middle of. Hurry, hurry, get me out of here!!! Sometimes God allows us to see His speed limits on our situations. Sometimes He makes us stop and lie down in green pastures so He can restore our souls. Have you ever found yourself resisting the limits or trying to close your eyes and breeze past anyway? 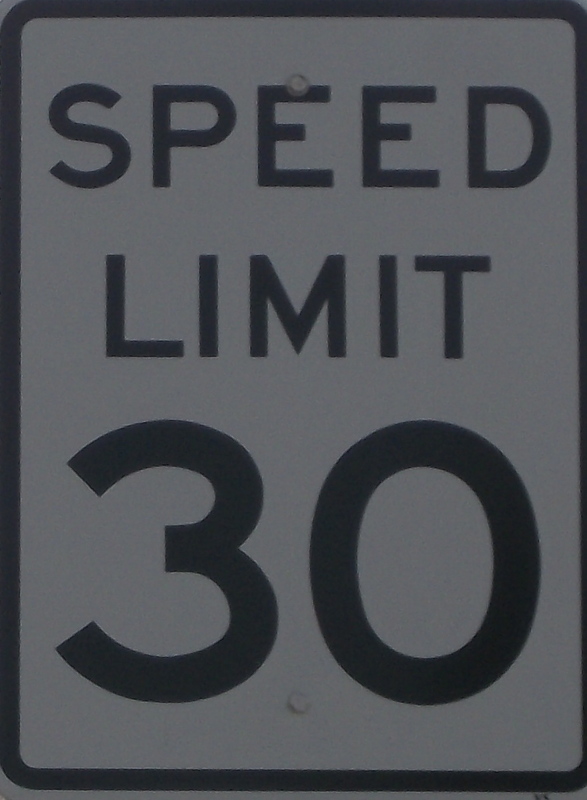 Think about how God uses speed limits in your life. Where are the places He would like you to slow down and take notice of His activity? You may be walking through a difficult time, but if time seems to move slowly maybe it is time to take look around thoughtfully and prayerfully. What is God doing during this time? Dig into God’s Word and notice the times when it appeared things were moving at a snail’s pace. Our time frame is certainly not God’s! Where is He going and at what pace? Is there something I can or should be doing in this time of speed limits? Heavenly Father, please help me see the speed limits you would like me to follow in my life. Give me your insight and heighten my awareness during a restricted speed zone so I can see what is happening around me and not endanger others with reckless speeds. Thank you for Your protection and blessing in my life!